FILE - Migrants stand behind a fence at the Nizip refugee camp in Gaziantep province, southeastern Turkey, April 23, 2016. Turkish President Recep Tayyip Erdogan repeatedly has threatened to end his country's refugee deal with the European Union, as relations continue to plummet. However, such a move may not be in Ankara's interests. Since last year's deal, the flood of refugees and migrants entering Greece and Bulgaria from Turkey has fallen to a trickle. Under the Readmission Agreement, Ankara accepts migrants and refugees who have entered EU countries illegally from Turkish territory, in exchange for Europe accepting vetted refugees from Turkey, along with billions of dollars of EU aid. "Punishing the entire Europe by unleashing a flood of Syrian refugees on them, it would be a massive step," warned political consultant Atilla Yesilada of Global Source Partners. Yesilada added that the effects of such a move would be magnified, given much of Europe is in an election cycle: "It would completely change the European election dynamics, and taking such a massive step sounds like a major bluff to me." The consequences of ending the deal would be considerable. "Since the deal, the dying, drownings in the Aegean Sea has dropped dramatically, while we've seen the deadliest year ever in the central Mediterranean off the coast of Libya," said Gerald Knaus, one of the architects of the deal and the head of the European Stability Initiative research group. Along with the trauma, analysts suggest a renewed exodus would deal another hammer blow to the tourism industry centered on the Aegean Sea. Self-interest may be the most important factor in the agreement's survival. Although the European Union has failed to deliver on visa-free travel to Europe for Turks, a key part of the bargain for Ankara, the readmission agreement remains important for Turkey. 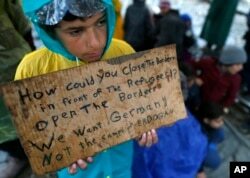 FILE - A migrant boy shows a banner saying he wants to travel to Germany rather than camps set up by Turkey, during a protest demanding the opening of the border between Greece and Macedonia in the northern Greek border station of Idomeni, Greece, March 23, 2016. "This is a knife that cuts both ways, you know," said political columnist Semih Idiz of Al-Monitor website. "This is a mistake from the beginning in negotiating this deal. It turned into a bartering situation. You give us the visas, and we will give you this and that sort of thing, but the fact is there are three million refugees in Turkey and this is a problem for Turkey, as well. And it's going to need help to cope with this. It's going to need help in terms of the social side. It's going to need help in terms of the security side, and it's going to need help with the economic-burden side." Ankara claims the cost of the refugees is in excess of $10 billion. Turkish political leaders have long complained about the lack of support they've received from their allies, in particular Europe. But despite some shortcomings, including the failure to deliver on visa-free travel, Knaus of European Stability Initiative says the European Union is now delivering on other aspects of the agreement. "It's the biggest humanitarian effort to support refugees in a third country that the EU has ever made. With the promise of two to three billion euros [$3.25 billion], and 1.5 billion [$1.6 billion] already contracted," Knaus said. "For this, Turkey had to commit to take back refugees from the Greek Islands, and so far the Greek asylum service has sent only 80 people a month — a total of 918 people in 12 months. And, in return, the EU has taken 4,000 Syrians from Turkey. So what would Turkey gain from withdrawing from the agreement?" Along with its material and financial gains, the refugee deal remains one of the few ties between Ankara and the European Union. With Turkey increasingly at odds with many of its neighbors, as well as difficulties with both Washington and Moscow, observers suggest the threat of diplomatic isolation will likely make Ankara step back from tearing up the refugee agreement. "This is one few, and certainly important, leverage that Ankara has over the EU," said Sinan Ulgen, a visiting scholar of Carnegie Europe Institute. But Ulgen offered a caveat, warning that despite the benefits, Ankara could be trapped by its rhetoric and forced to act even if it's not in its interests. "We have been hearing recurring threats from Ankara over the past few months, so it must be taken seriously, especially if the EU starts to harden its stance toward Turkey," Ulgen said. "The aggressive rhetoric we've seen from Ankara toward the EU, especially in the last few weeks, the tensions within Turkey, the human rights problems ... all of this has made it very difficult to maintain the level of trust needed to solve problems, even when there are mutual interests," Knaus said. "On the refugee issue, it is the one area where the EU and Turkey, because they both have an interest in the EU, help to improve conditions for refugees in Turkey. Turkey is helping the EU to stop the Aegean turning into a deadly sea again. They both managed to work together. It's just to be hoped that basic level of trust can be maintained."